Paul Jewell is the manager of the relegated Premier League side Derby County. Jewell took over as manager in the fall after having resigned his post at Wigan Athletic at the end of last season. The reason I can relate to Jewell is because although he has had tremendous success in the lower divisions, specifically leading Wigan from League 2 all the way to the Premiership, he hasn't been able to accomplish much at Derby, with the team having won just a single match in 34 played this season. Similarly, the girls team that I coach, which dominated their rec division in U7 and U8, has really struggled to find its groove since we've moved up both an age group and competition level to U10 Select. The first several games last year were on par with Derby taking on pretty much anyone in the top half of the Premiership. There were several games where I was just hoping to come away not being embarrassed too badly. This year has gone a bit better so far, but we're still struggling at 0-2. In both of our matches, we have started out strong, with our defense playing quite well. But as the game wears on we seem unable to hold it together. I think a big part of that comes from having four new players on the team. Two of them are doing quite well, while the other two would have never made it through tryouts if I'd had any part of the process. It's a challenge as a coach, because on the one hand, it's youth sports and I feel like everyone needs to play a reasonable chunk of the game. On the other hand, it's hard to put the rest of the team in a position where their confidence gets destroyed because I need to get everyone on the field. It was another bad week for the Gunners as well. I went into Sunday's match with high hopes that we could wrest three points and still make a run at the title, but it was not to be. It was really some bad luck as much as anything else. We should have been up one if not two goals at the half, but couldn't seem to get them to roll in. We finally got on the score sheet early in the second half and were unfortunate not to make it two after Rio Ferdinand very nearly conceded an own goal just minutes later. As has happened so many times lately, the lead didn't last, with Ronaldo scoring on an unnecessary penalty followed by Owen Hargreaves knocking in the winner on a stunning free kick. It will be an interesting off season to say the least. Gilberto and Jens Lehmann, two mainstays of last year's squad, have seen very little time this season. I doubt either will stick around come summer. It's a shame, too. While Almunia is more consistent than Lehmann, the latter is a better playmaker and can make stops that Almunia can't. Gilberto has been the tougher of the two to watch, though, as he was clearly the best player on the squad last year with Henry injured for most of the season. He has been replaced this year by Mathieu Flamini, but as well as Flamini has played this season, Gilberto last year was much better than Flamini this year. 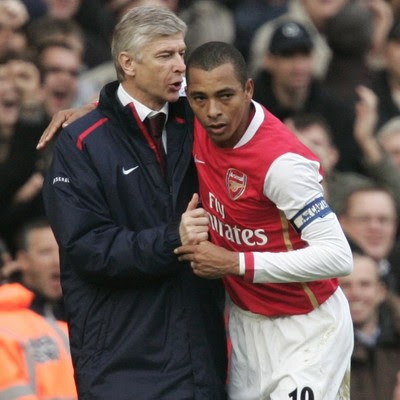 I have to think that Gilberto would have stepped up and delivered once again had he been given the opportunity. Wenger has indicated that he doesn't have plans to buy new players over the summer, however. This is consistent with his philosophy of developing young talent, which also seems to have influenced his decision to start Flamini and Almunia ahead of Gilberto and Lehmann for most of the season. Philosophically it's a question of whether it's more valuable to have an experienced player on the field or to give a young player experience that he can use in the future. My approach would be to try and win today without worrying so much about next season--in too many cases points get dropped because managers are so worried about future matches that they forget to take care of the one they're playing today. Wenger is as prone to this as anyone. If I were in Wenger's shoes, the most poignant need I'd be looking to fill would be at central defense. Phillipe Senderos is a great guy--exactly the kind of team player every coach enjoys having on the squad. He tries harder than anyone on the pitch and is perfectly content sitting on the bench until called upon. Unfortunately, he plays for Arsenal, and the system requires speed in central defense. William Gallas is not slow by any means, but he's as slow as one can afford to be in that position, and he would not be nearly as effective were Kolo Toure not there to back him up. There are two key things I don't understand about Wenger's approach to his defense: first, why not pick up Jonathan Woodgate when he was available in January? Second, with Bacary Sagna out with injury, why not move Emmanuel Eboue back to right back and keep Toure in central defense? Eboue was an outstanding right back all of last year--in fact, he was perhaps the perfect right back: always in the attack, yet fast enough to never get beat on the other end. Moving Toure over to right back has never made any sense especially given that Eboue is a better defender than midfielder and Theo Walcott is available for right wing. The door remains open, however, for a limited amount of activity this summer. As Wenger said "if we can add one more body we will do so, not one in each department - just one experienced guy." Which leaves me wondering, who is this experienced guy that Wenger has his eye on? Which end of the continuum are you on?